I started with a white sweatshirt from Target for $16.00- that price is more like it! 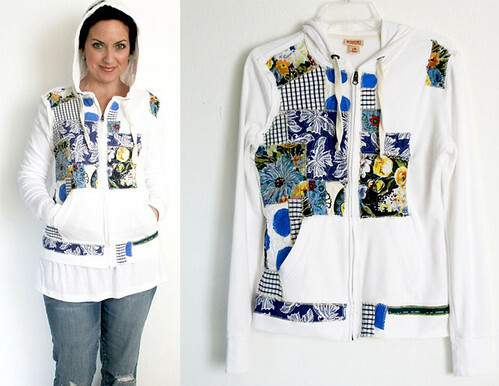 Tip-When sewing and altering cotton (t-shirts and sweatshirts) I always purchase things 1-2 sizes larger (M or LG) than my true size (SM) to keep things fitting well once the the garment is altered with sewing or washed. I used pieces of recycled fabric- from my scrap pile and from old clothing that would have otherwise been donated. I decided on only using variations of blue. 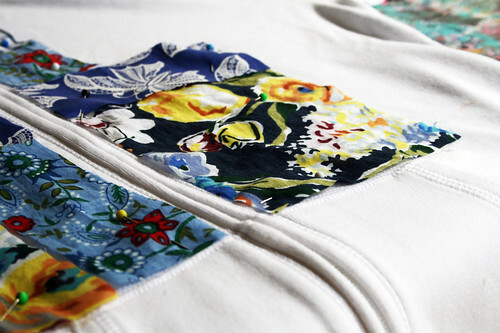 I arranged the pieces all over the surface of the sweatshirt and pinned them down. and sewed them all down- EASY! fyi-I used a universal needle and my darning foot (only because I use this foot for everything). I do the same in Anthropologie-well when I am visiting back east and it is 5 minutes from both of my sisters homes. Now, if I can just learn to sew! That turned out SO good! I love how you recreate things like this-thanks so much for sharing! That is SO AWESOME!!!! I love it!! that's something I would pay 100 dollars for, love it! That looks great! I have a black hoodie I feel is so dull...I believ it will have a similar makeoverf. Thank you!!!! Oh that is so amazing I love it. Hope the colour doesn't run when you wash it though! It so is good, you are very talented. That hoodie looks gorgeous on you! That's an amazing transformation. It's a wonderful interpretation of the Anthropologie ones. In fact, I like it better than theirs. 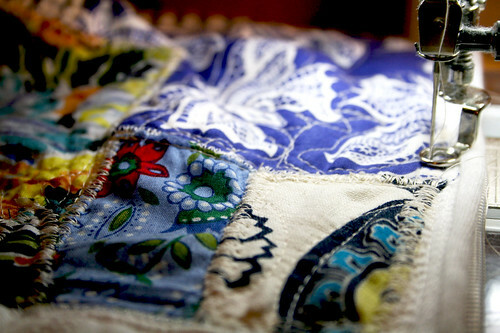 I love the stitching ... the doubled/tripled up zigzags and the meandering patterns on top. I must try it! Love the idea. I too window shop at anthropologie.... it is crazy that they can charge so much. 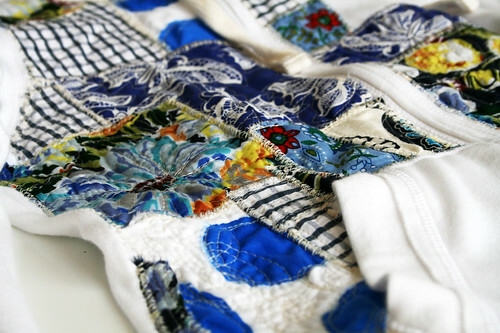 Did you use a straight or zigzag stitch? and Did you need to do any special settings on your sewing machine, because of the sweatshirt fabric? Thanks! Great idea!! That would SO rock ArtFiberFest! Miss it and miss you. You are a constant source of inspiration though, thanks for all you share and inspire! Oh I love this, it really looks awesome on you and is such a simple idea too! Hi Alisa! I've been stalking your blog for a while now and thought it about time to leave a little love! Your posts never fail to inspire me! Thank you thank you!! Question... I want to start sewing and was wondering if you have any machine recommendations. What kind of sewing machine do you use? great idea. good use of fabric scraps to create something unique. Love, love, love this. And how useful for covering that paint on your favorite shirt! Thanks so much for the tutorial! I like your version much better! 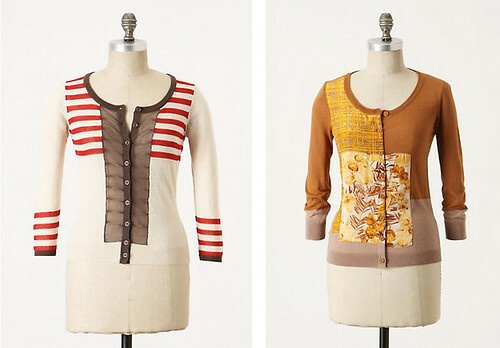 and just who does buy (not-on-sale)clothes at Anthropologie? Great idea! 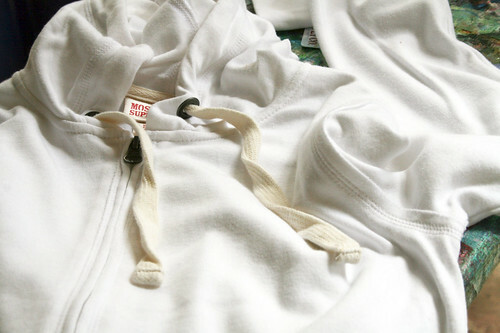 Did you have any problems with the hoodie no longer being stretchy where you sewed on the fabric? That is absolutely fabulous! Great work, Alisa. I LOVE IT! You are SO creative. I love following your blog as each post is a wonderful surprise. I agree with you about Anthropologie. I once saw a faux pearl necklace there with flowers attached. Very expensive. I just went home and made my own. Beautiful! Thank you for sharing your idea. I can't wait I'm going to try one out! Your sweater looks pretty! Can I just say that you come up with the coolest and most realistic things on this blog. LOVE what you do and thanks for the constant inspirations. This could be great fun--once again, thank-you. That's so pretty Alisa, I love this! Thanks so much, I'll be linking. I love what you did to change it up and it turned out awesome! You are amazing. Thanks for sharing this tutorial. I will have to try that! I am still trying to locate a darning attachment for my sewing machine.. I guess it is soo old! Love it! Sa-weet! I'm digging through my piles first thing after my cutie pie is in bed! Thanks for sharing! This is amazing! I love love love it! Your sweatshirt looks super fancy! I love this! I've been doing this with fabric patches and I've gotten so many compliments. It's either that they really like it or they're wondering what I'm wearing so they feel the need to say something! Thank you for this tutorial! I am going to stop by Target today to get a sweatshirt and try this!! This is such a great idea! I used to take hoodies and embelish them with quilt blocks but I don't like wearing sweatshirts anymore. But hoodies - that's another thing. Thanks for the post. Another thing to put on my list to do! i love it. i "sew" want me one. Sei molto creativa! Bellissimo il tuo blog! Wow it is so nice ! I have almost the same at home, I have to do the same with it !! I just found your blog yesterday and I love it. Your creativity is inspiring and I have already made my version of your sweatshirt!! I am excited about it..it is my new favorite clothing item and I have not even worn it yet! 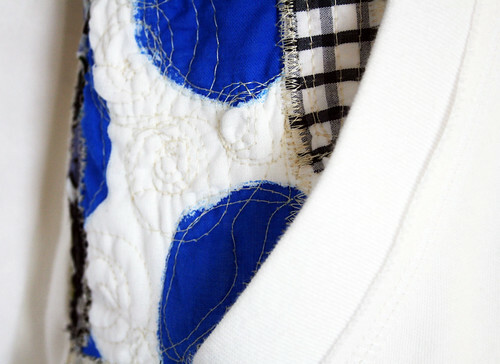 Please tell me --how do you do such amazing circles on your sewing machine? When you use your darning foot, do the feed dogs stay down? That is the only thing I can figure. When I tried circles on mine, it was awkward and I came out with a really pointy circle! 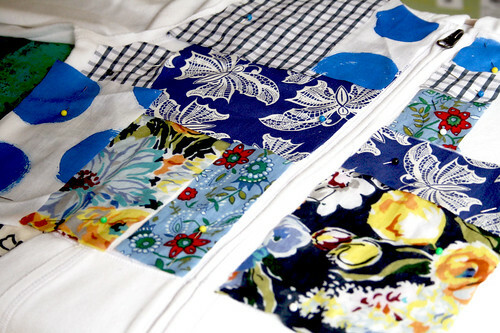 Hey Alisa-any tips/advice on doing this project by hand sewing (I don't have a machine or access to one). That looks great! I have a black hoodie I feel is so dull...I believ it will have a similar makeoverf. Love this! Thanks for the inspiration!!! good ol' fashioned fun at the fair!